So, I've posted before about Klout - basically, it's a site that measures your social influence on your online networks. The fun thing about Klout is the perks: based on your score and demographics, from time to time you are eligible to claim perks! Sometimes the perks are in the form of a discount on a particular brand/company, or an exclusive invite or preview...but sometimes they're free products! The perk I received in the mail today was this type. It's a full sized Monoi Repairing Split End Sealer by Carol's Daughter. This was an exciting perk for me because I have been working on growing out my hair color and I've been trying to baby it as much as possible to keep it nice and healthy, so any product like this is welcome! 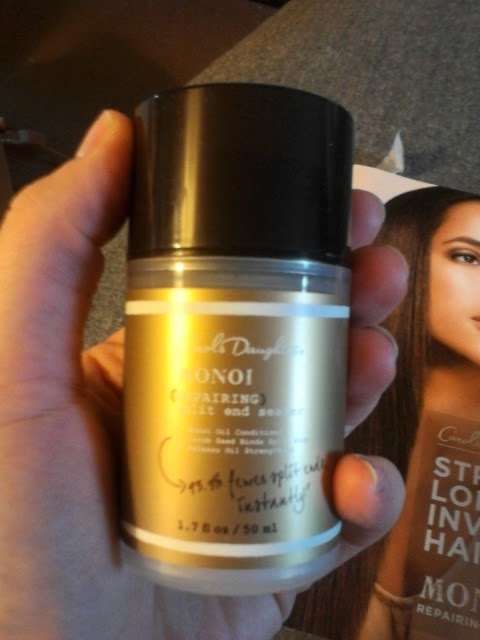 I've also heard a lot lately about Carol's Daughter and have been wanting to try some of their products. They make natural skincare, haircare, and beauty products and in general receive pretty good reviews! Monoi oil has been made and used in Tahiti for centuries. It includes Tiare Gardenias and Coprah Coconut and is used to heal and protect the skin. 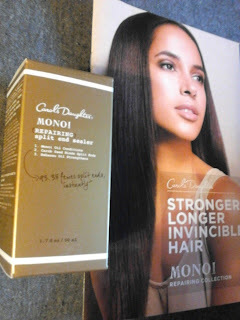 The Monoi Repairing Collection by Carol's Daughter contains no sulfates, parabens, petroleum, mineral oil, or artificial colors. In addition, they promise 13x longer hair life, 96% reduced breakage, and to seal 93.3% of split ends in as little as one use. Pretty big promises, but we'll see! My first impression of this product is positive. It is a cream with a nice consistency, and it does smell of gardenias! I worked it into my hair as directed, and currently my hair smells great and looks and feels nice and soft. I will post a review after I've been using it for a while! In the meantime, definitely join Klout if you haven't yet...it's a fun way to get to try new things.